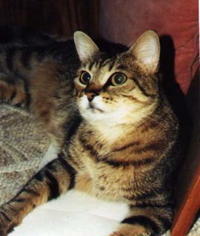 Eight years ago today, our dear sweet Maggie went to kitty heaven. Bill & I had adopted her from the Humane Society on September 1, 1986. She was about a year old at the time and was 17 1/2 when she died. She had broken a bone in her leg in November 2002. To this day, we have no idea how she did it but the vet had said it was probably brittle bones caused by age and her thyroid medication. She never fully recovered and suffered what the vet believed was a stroke on the morning of February 22, 2003. Stan is the most beloved player in Cardinal history and a true gentleman. Congratulations Stan! I won't need to take my laptop with me when we go on vacation!